For those of you out there who love skiing or snowboarding, you have to know that the Swiss Alps are on the list of places to go. There are a huge range of resorts, some even let you venture out of Switzerland while you enjoy amazing snow. 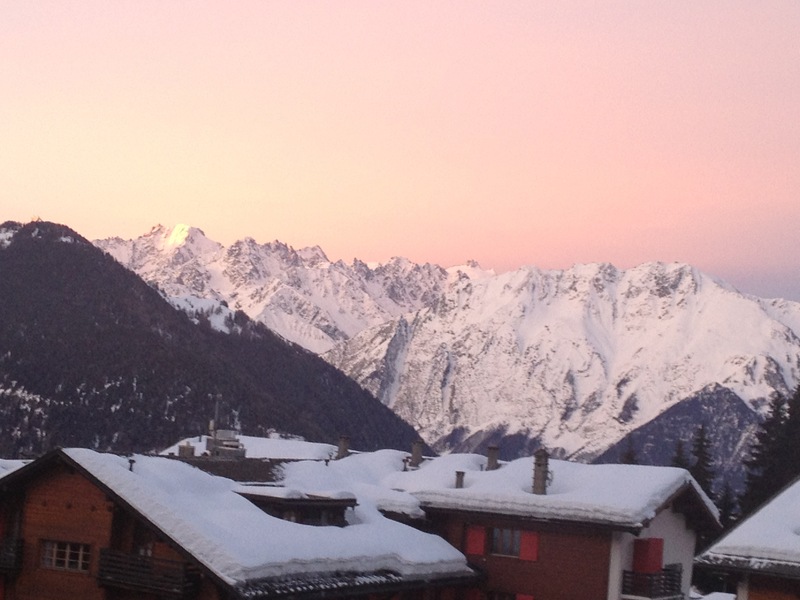 We chose to go to the 4 valleys: Verbier, Veysonnaz, Nendaz and Thyon. 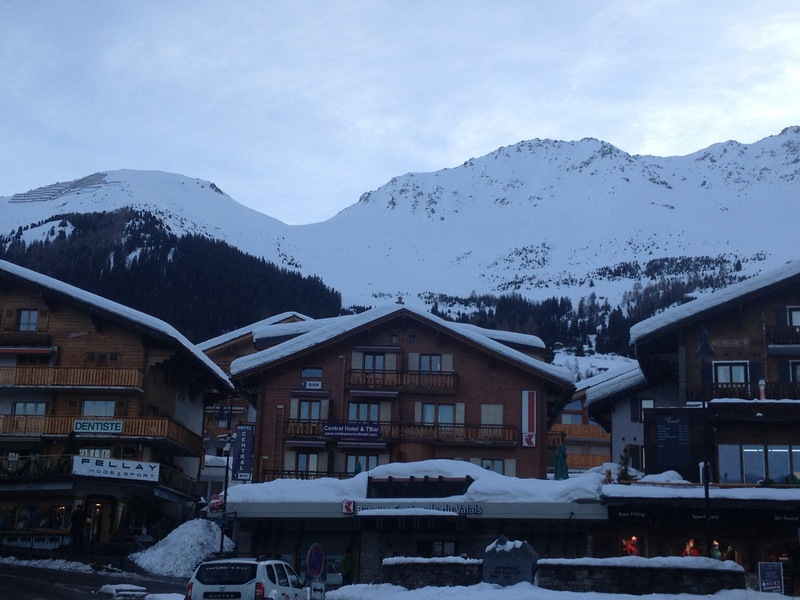 Verbier was the resort we picked, as it is the biggest one. These valleys have a total of 410Km of marked pistes. Being one of the premier “off-piste” locations in the world means there is way more terrain than you could ever imagine. We experienced the most magical conditions. To read about that, click here. There are numerous options for getting to Verbier. If you don’t want to spent the money on a private transfer, you can catch a train to Le Chable, where the station meets the gondola that takes you to Verbier. We went for the option in between, and paid for a shared transfer using the Verbier Express. This is a mini bus service that picks you up from the Geneva Airport and takes you directly to Verbier. Although it can take 8 passengers, we were the only ones so it was like a private transfer. There are other options as well, which include buses that make numerous stops at other resorts along the way. For 70CHF the Verbier Express was not bad for a 2 hour drive. 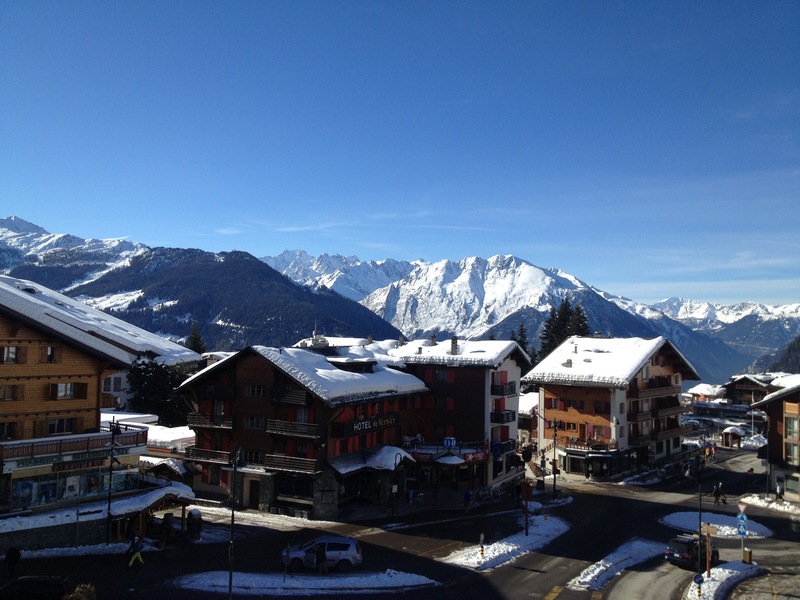 There are a whole range of accommodation options in Verbier, especially if you have a large group. There are luxury chalets for those who don’t know what a budget is. Richard Branson owns a chalet that you can rent for the reasonable price of 82000CHF – 150000CHF per week (depending on dates). There are also many chalets/apartments for those who don’t have that kind of money to spend. Because it was just two of us, our most affordable option was to book a hotel room. 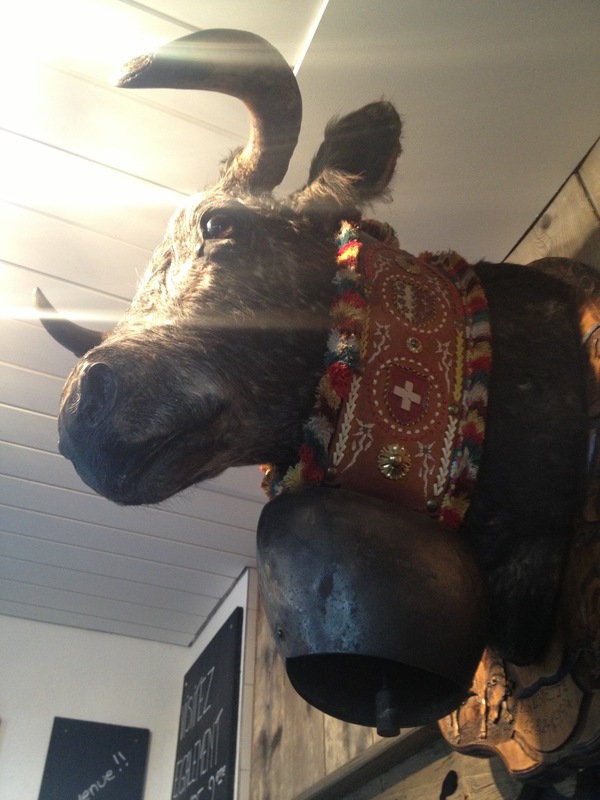 The bonus about hotels in Verbier is that they are all very central. After much research, I settled on booking the Central Hotel. As the name suggests, it is in the centre of town and walking distance from everything you could possibly need. The building in the centre of the picture is where the hotel is located. It was perfect. There are rooms for up to 20 guests, which allows for a more personalized experience. The staff make you feel at home, and the rooms are 100% comfortable. We picked a room with a balcony. Even though it is usually freezing cold outside, our balcony faced the afternoon sun, making it nice to sit and have a beer after a day of skiing. 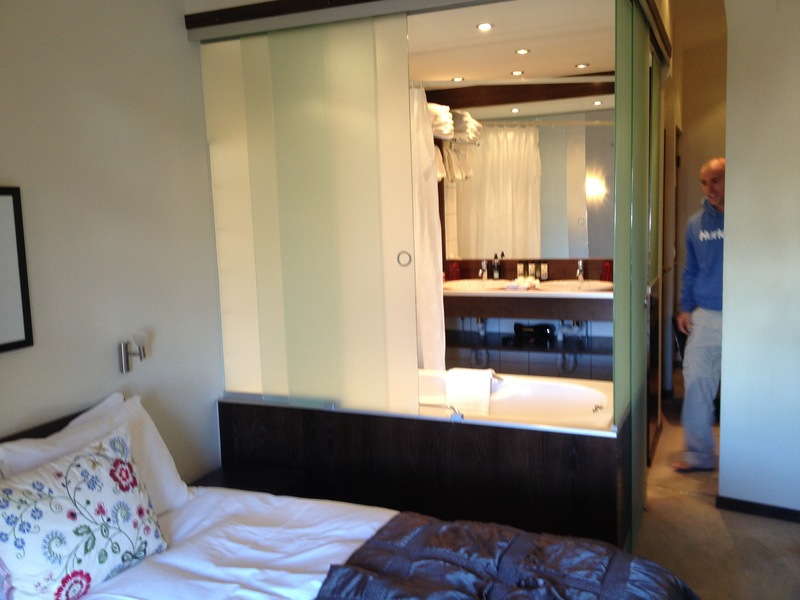 The rooms at the Verbier Central Hotel are equipped with everything you could possibly need during your stay. 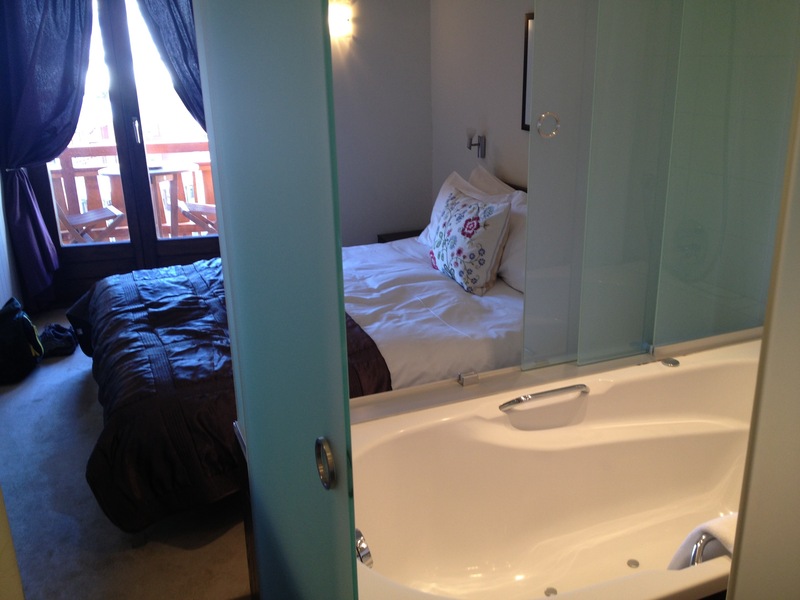 They even have a beautiful spa bath to relax into after shredding the slopes, including delightful bath products. The ski room downstairs is heated, which means nice warm boots every morning. There is nothing worse than having cold boots, trust me. Our stay at this hotel was entirely perfect. 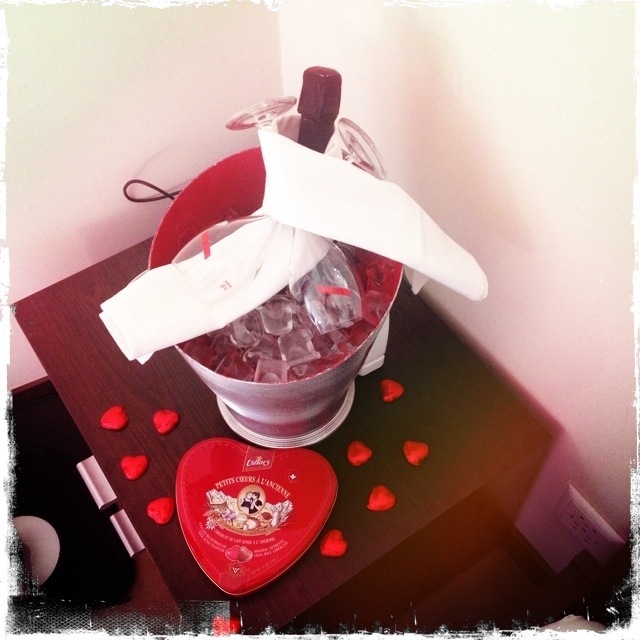 When we got engaged, the staff went out of their way to make us feel ultra special by leaving a bottle of champagne and heart shaped Swiss chocolates on our bedside table when we returned from skiing. Although we chose this hotel because there were only two of us, the layout of the rooms also allows for larger groups or families to stay together. 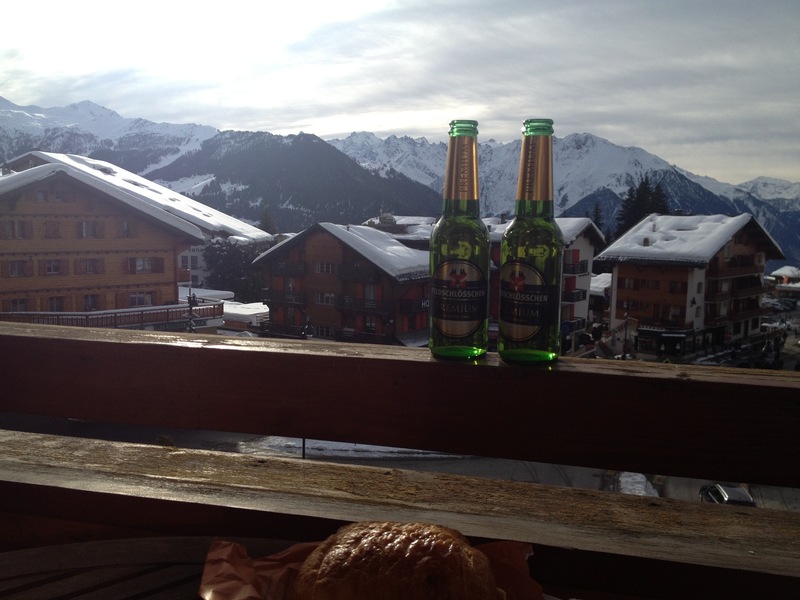 If you are interested in staying in Verbier, that is definitely the place I recommend. Click here for their website. 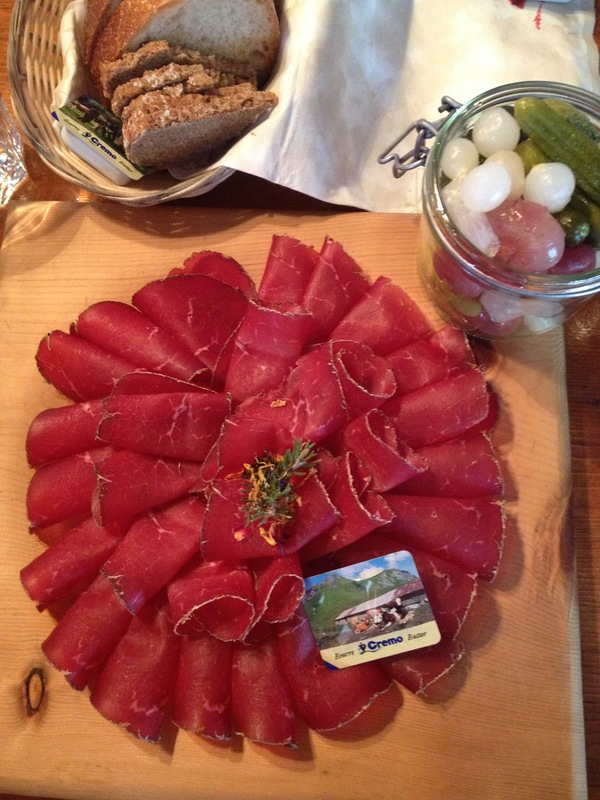 For those interested in the Swiss culinary experience, there are endless restaurants and bars throughout Verbier. 1. Le monde des crepe: I recommend avoiding this one, no matter how badly you feel like eating a crepe. They are very dry, and not crepe like at all. Instead, you can find good crepes in the stand across from the Medran Station, attached to Relais De Neige. It is only open during the day. As you can see in the photo, we had beer with it. Big mistake, but still tasty. 3. 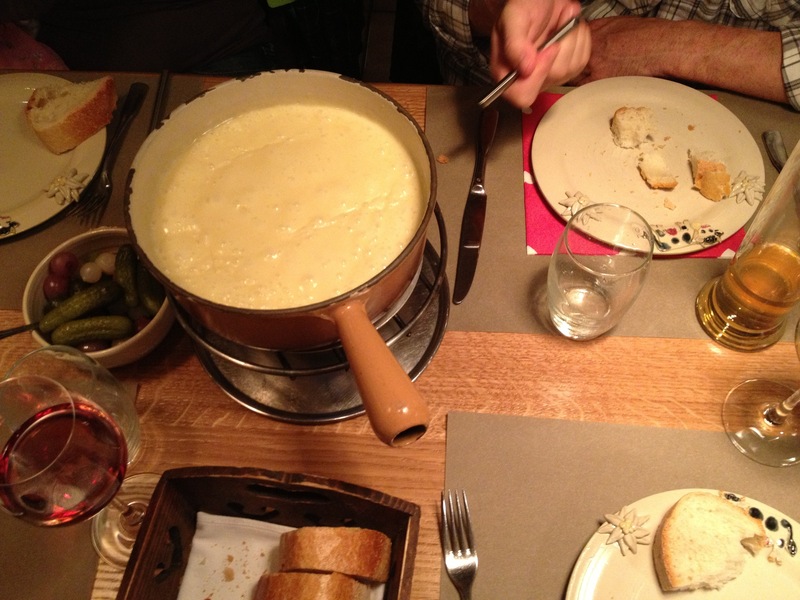 The better fondue we found was at La Channe Restaurant. It had way more flavour. We did the right thing here and had white wine and tea to drink with the fondue. Because we had not expected to eat one, Ryan drank a beer beforehand. Oops. 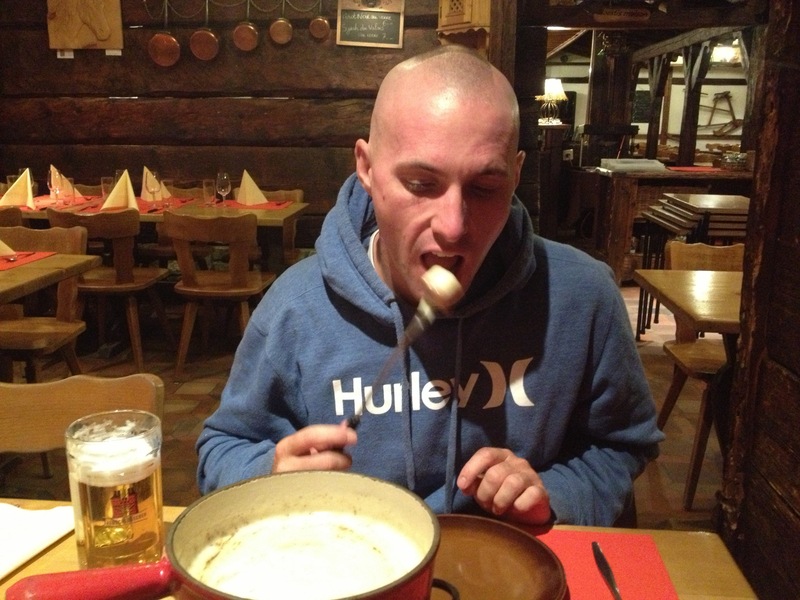 It doesn’t take long to feel cheesed out in Switzerland, so another option is a fondue Chinoise (Chinese fondue). This starts out with a salad. For the main meal you are served high quality strips of beef that you cook to your taste in a Chinese broth in the centre of the table. There are various dipping sauces, and French fries to accompany the meal. 4. For some Italian food, we tried Borsalino twice. It is decent food but nothing to rave on about. I recommended it for a quick meal when you are very tired, like we were. 5. 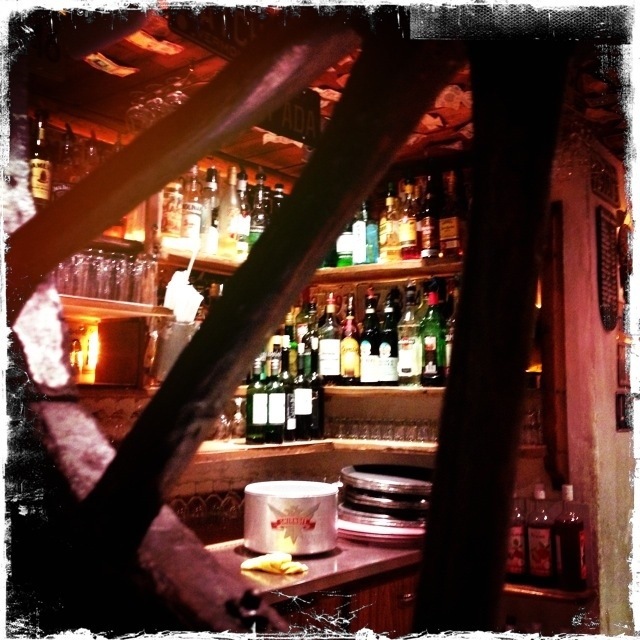 Le Fer a Cheval – this is an awesome bar/restaurant with a great après ski atmosphere. The food was divine, except for one meal Ryan picked from the specials board. Ryan is renown for picking the worst thing on the menu and he did it again. Don’t eat risotto here. 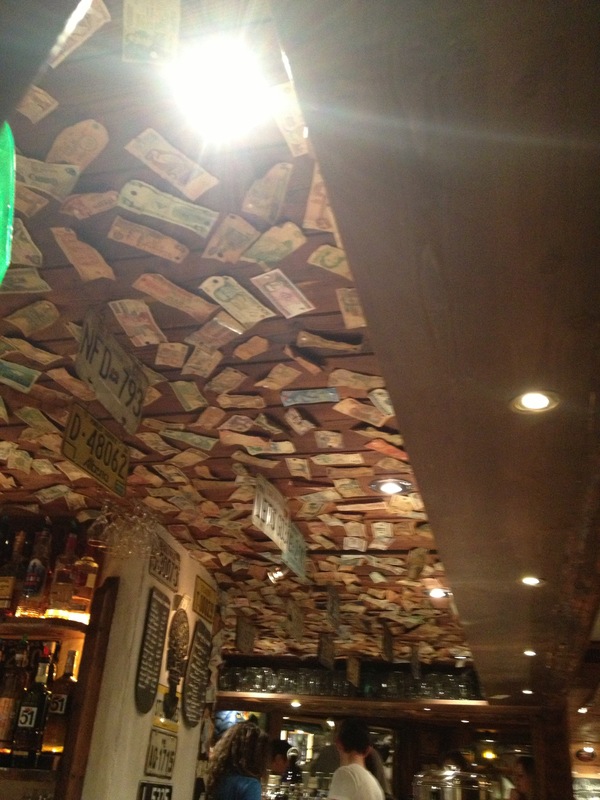 If you are short on cash, maybe you can pick some international currency off their ceiling. 6. 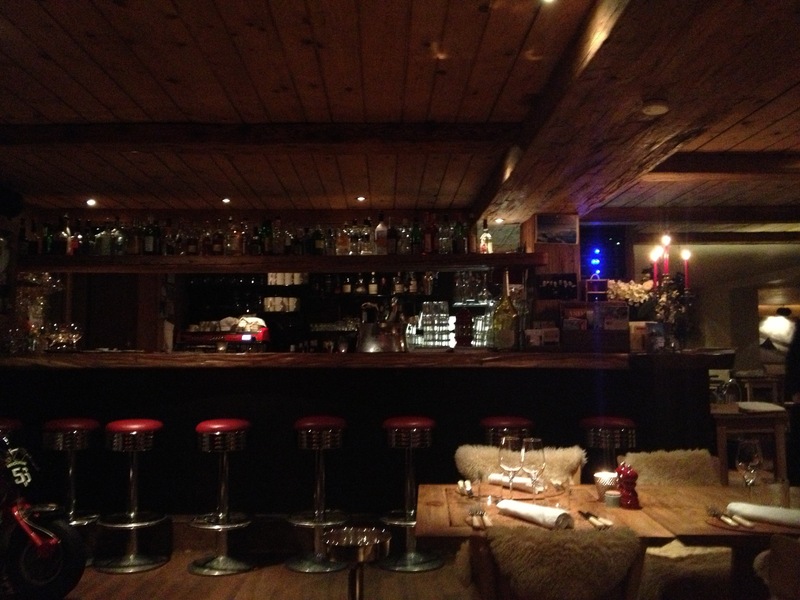 Le Rouge – this is more of an upper class après ski bar/restaurant. We were there too early to really see it in action. The menu consists of a lot of Swiss dishes. We were a bit cheesed out so we both went with the steak. Although the flavours were delicious, the steak was quite tough. 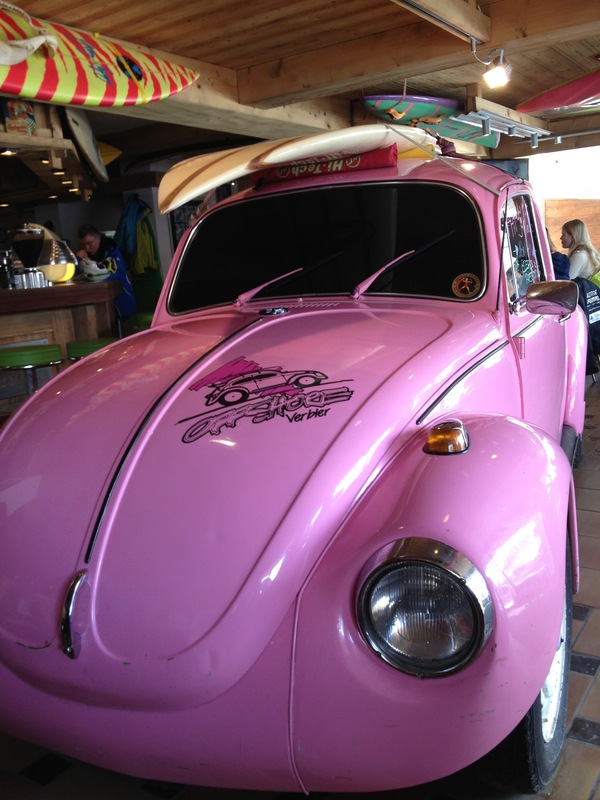 There are a whole range of different pit stops throughout the four valleys where you can stop for lunch. Even if we had tried to make it to all of them during our 10 days skiing, we would not have managed. Some are cafeteria style. Others are restaurants. 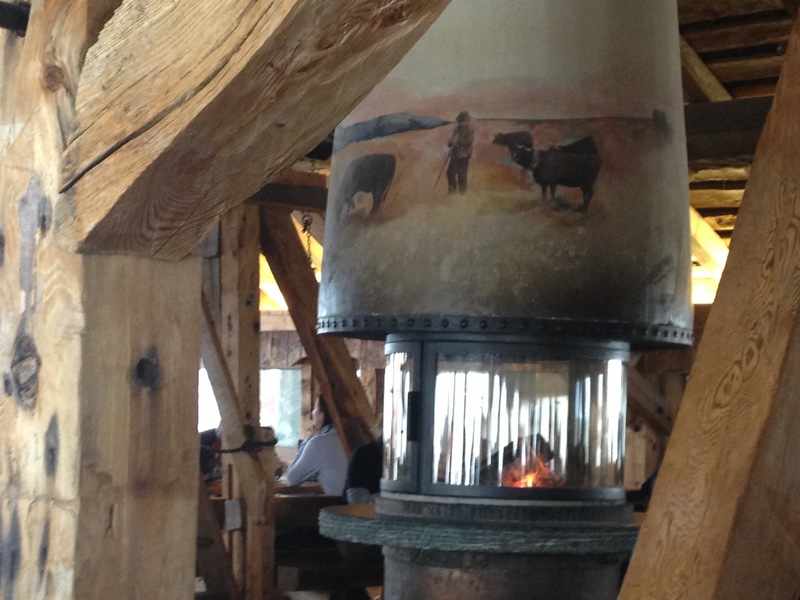 The two stand out restaurants for us were La Vache and Restaurant Les Chottes. 2. Restaurant Les Chottes – this was our favourite. We stopped here for lunch twice, and loved the fireplace to warm us up. I recommend the Italian selections on the menu. Spaghetti bolognese to die for, and the oh so cheesy lasagne. The peculiar thing about this restaurant is that it has a jacuzzi heated to 37.5 degrees on the terrace, even in winter. Now, I am definitely one to bring swimwear where ever I travel… I never even thought to bring them up the ski slopes with me. At least now you can be prepared if you plan on visiting. We sensed a strong après ski vibe in this town. It got to the point where we thought people just put on their ski gear and walked around to the après ski bars without even going skiing. To be honest, we ski’d ourselves so hard that we did not get to experience much of the party scene. The skiing was just that good!!!!! We managed one night. And it turned into a big one. 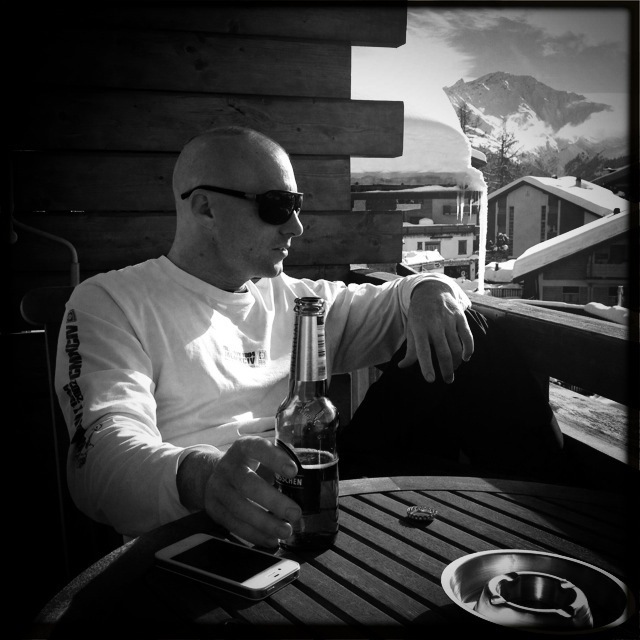 It seems that après ski can start around 2pm. The place: Chez Dany. This is a restaurant located on the path during the ski back into town. We stopped there a few times and loved it. It’s also a great place to try the traditional dried meat of the area (Viande Séché). This was the day after our engagement (click here to find out about that). What better way to start out than with a bottle of champagne?? Errrrr ok, we had already drunk a few wines with lunch at Les Chottes. 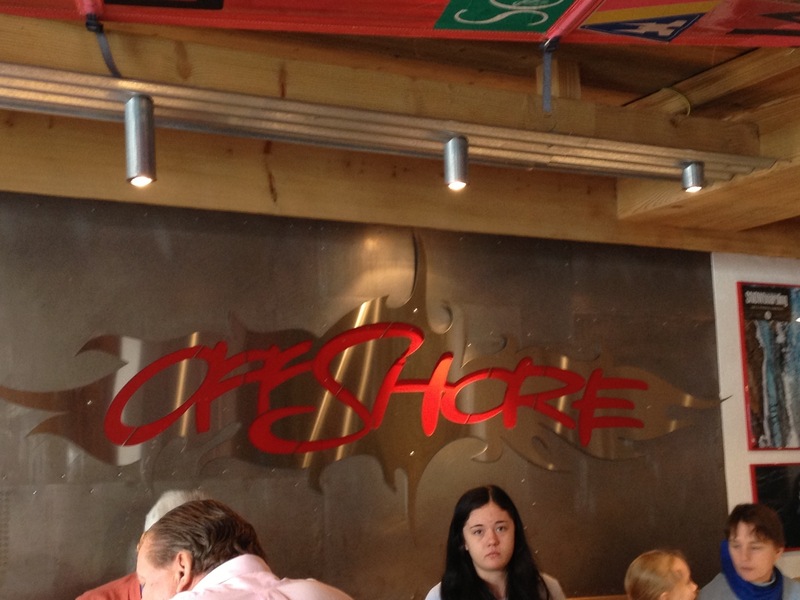 The next place to go would be either Le Fer a Cheval or Offshore. Ok, I’ll be honest with you. Ryan and I skipped this part. Then between 6pm and 9pm the bar at Hotel Farinet is really pumping. Here, there are no rules. No rules in relation to the price of drinks either, ouch. Jugs of beer is the way to go. It’s a great place for those into the party scene. A live band plays every night during these times. The roof slides open intermittently to let some fresh air in. Once that is over, t-bar provides another great party zone. There are often live bands here as well. Once the staff at t-bar have had enough, they move you on to chasbah which is open until 6am (we lasted until 2am). It seems that all these places share the après ski love. They are super close to each other as well. With après ski, there sometimes comes a hangover. 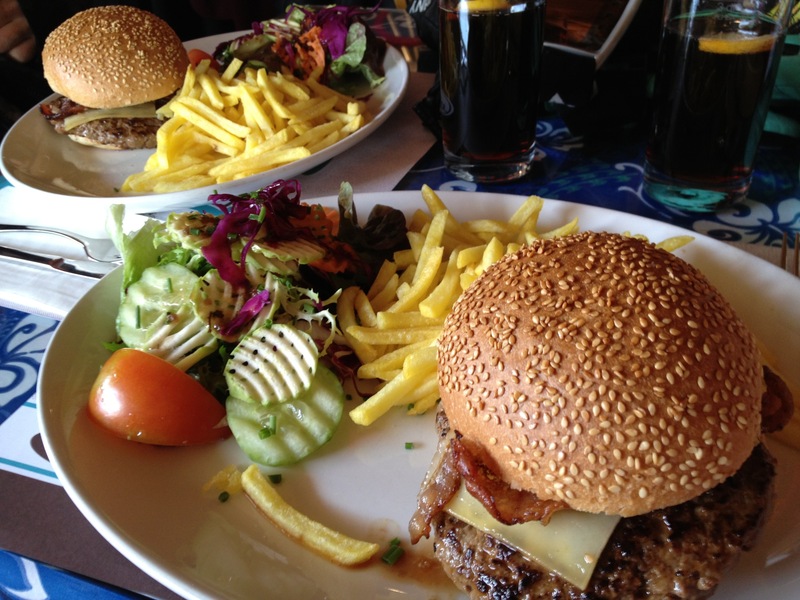 Help your situation by having one of the delicious burgers at t-bar or offshore. For those who are interested in the amazing skiing conditions, click here and here to see my previous posts. The current Europe ski season is almost over for this year, but it’s never too early to start planning for the next one. Hope to it. Verbier books out quite quickly.